In Italian folklore, Befana (pronounced [beˈfaːna]) is an old woman who delivers gifts to children throughout Italy on Epiphany Eve (the night of January 5) in a similar way to St Nicholas or Santa Claus. A popular belief is that her name derives from the Feast of Epiphany or in Italian La Festa dell'Epifania. Epiphania (Epiphany in English) is a Latin word with Greek origins. "Epiphany" means either the "Feast of the Epiphany" (January 6) or "manifestation (of the divinity)." Some suggest that Befana is descended from the Sabine/Roman goddess named Strina. In popular folklore Befana visits all the children of Italy on the eve of the Feast of the Epiphany to fill their shoes with candy and presents if they are good. Or a lump of coal or dark candy if they are bad. In many poorer parts of Italy and in particular rural Sicily, a stick in a stocking was placed instead of coal. Being a good housekeeper, many say she will sweep the floor before she leaves. To some the sweeping meant the sweeping away of the problems of the year. The child's family typically leaves a small glass of wine and a plate with a few morsels of food, often regional or local, for the Befana. She is usually portrayed as an old lady riding a broomstick through the air wearing a black shawl and is covered in soot because she enters the children's houses through the chimney. She is often smiling and carries a bag or hamper filled with candy, gifts, or both. She is also referred to as the Christmas Witch. Christian legend had it that Befana was approached by the biblical magi, also known as the Three Wise Men (or the three kings) a few days before the birth of the Infant Jesus. They asked for directions to where the Son of God was, as they had seen his star in the sky, but she did not know. She provided them with shelter for a night, as she was considered the best housekeeper in the village, with the most pleasant home. The magi invited her to join them on the journey to find the baby Jesus, but she declined, stating she was too busy with her housework. Later, La Befana had a change of heart, and tried to search out the astrologers and Jesus. That night she was not able to find them, so to this day, La Befana is searching for the little baby. She leaves all the good children toys and candy ("caramelle") or fruit, while the bad children get coal ("carbone"), onions or garlic. Another Christian legend takes a slightly darker tone as La Befana was an ordinary woman with a child whom she greatly loved. However, her child died, and her resulting grief maddened her. Upon hearing news of Jesus being born, she set out to see him, delusional that he was her son. She eventually met Jesus and presented him with gifts to make him happy. The infant Jesus was delighted, and he gave La Befana a gift in return; she would be the mother of every child in Italy. Popular tradition tells that if one sees La Befana one will receive a thump from her broomstick, as she doesn't wish to be seen. This aspect of the tradition may be designed to keep children in their beds. Another commonly heard Christian legend of la Befana starts at the time of the birth of baby Jesus. Befana spends her days cleaning and sweeping. One day the magi, also known as the three wise men, came to her door in search of baby Jesus. Befana turned them away because she was too busy cleaning. Befana notices a bright light in the sky; she thinks this is the way to baby Jesus. She brought some baked goods and gifts for baby Jesus in her bag and took her broom to help the new mother clean and began her search for baby Jesus. She searched and searched for Baby Jesus, but never found him. Befana still searches today, after all these centuries. On the eve of the Epiphany, Befana comes to a house where there is a child and leaves a gift. Although she has been unsuccessful in her search, she still leaves gifts for good young children because the Christ Child can be found in all children. An interesting theory connects the tradition of exchanging gifts to an ancient Roman festivity in honour of Ianus and Strenia (in Italian a Christmas gift used to be called strenna), celebrated at the beginning of the year, when Romans used to give each other presents. "This Befana appears to be heir at law of a certain heathen goddess called Strenia, who presided over the new-year's gifts, 'Strenae,' from which, indeed, she derived her name. Her presents were of the same description as those of the Befana—figs, dates, and honey. Moreover her solemnities were vigorously opposed by the early Christians on account of their noisy, riotous, and licentious character". The tradition of Befana appears to incorporate other pre-Christian popular elements as well, adapted to Christian culture and related to the celebration of the New Year. Historian Carlo Ginzburg relates her to Nicevenn. The old lady character should then represent the old year just passed, ready to be burned in order to give place to the new one. In many European countries the tradition still exists of burning a puppet of an old lady at the beginning of the New Year, called Giubiana in Northern Italy, with clear Celtic origins. Italian anthropologists Claudia and Luigi Manciocco, in their book Una Casa Senza Porte (House without a Door) trace Befana's origins back to Neolithic beliefs and practices. The team of anthropologists also wrote about Befana as a figure that evolved into a goddess associated with fertility and agriculture. 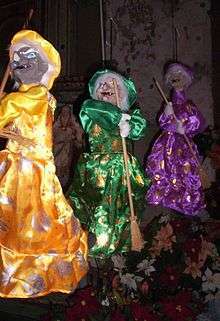 Befana also maintains many similarities with Perchta and her Pre-Christian Alpine traditions. The Befana is celebrated throughout all of Italy, and has become a national icon. In the regions of the Marches, Umbria and Latium, her figure is associated with the Papal States, where the Epiphany held the most importance. Urbania is thought to be her official home. Every year there is a big festival held to celebrate the holiday. About 30,000-50,000 people attend the festivities. Hundreds of Befana’s are present, swinging from the main tower. They juggle, dance and greet all the children. Traditionally, all Italian children may expect to find a lump of "coal" in their stockings (actually rock candy made black with caramel coloring), as every child has been at least occasionally bad during the year. Piazza Navona in central Rome is the site of a popular market each year between Christmas and the Epiphany, where toys, sugar charcoal and other candies are on sale. The feast of the Befana in Rome was immortalized in four famous sonnets in the Roman dialect by the 19th century Roman poet Giuseppe Gioacchino Belli. In Ottorino Respighi's 1928 Feste Romane ("Roman Festivals"), the fourth movement, titled La Befana, is an orchestral portrayal of this Piazza Navona festival. Romans believe that at the midnight January 6 the Befana shows herself from a window of Piazza Navona, and they always go there to watch her (it's a joke everybody tells while going to the feast to buy candies, toys and sweets). The town of Urbania in the Province of Pesaro e Urbino within the Marches, where the national Befana festival is held each year, usually between January 2 and 6. A "house of the Befana" is scheduled to be built and the post office has a mailbox reserved for letters addressed to the Befana, mirroring what happens with Santa Claus in Rovaniemi. In Fornovo di Taro a little town by Parma the national meeting "Raduno Nazionale delle Befane e dei Befani" is held the 5th and 6 January. In other parts of the world where a vibrant Italian community exists, traditions involving Befana may be observed and shared or celebrated with the wider community. In Toronto, Canada for example, a Befana Choir shows up on Winter Solstice each December to sing in the Kensington Market Festival of Lights parade. Women, men, and children dressed in La Befana costume and nose sing love songs to serenade the sun to beckon its return. The singing hags gather in the street to give candy to children, to cackle and screech to accordion music, and to sing in every key imaginable as delighted parade participants join in the cacophony. Sometimes, the Befanas dance with parade goers and dust down the willing as parade goers walk by. ↑ "Viva La Befana". Transparent Language 6 Jan, 2009. 12 Dec, 2009. <http://www.transparent.com/italian/tag/la-befana/>. 1 2 D. Augustine de Civit. Dei, lib. iv. c. 16. ↑ "LA VERA STORIA." La Befana n.d. 13 Dec, 2009. <http://www.la-befana.it/>. ↑ "The Legend of ’La Befana’". John D. Calandra Italian American Institute n.d. 12 Dec, 2009. <http://qcpages.qc.edu/calandra/community/commbefa.html/>. ↑ Ovid Fasti i. 185. ↑ Giglio, Michael. "Taking Flight with Italy’s Holiday Witch." Spiegel Online 12 Dec, 2008. 15 Dec, 2009.<http://www.spiegel.de/international/europe/0,1518,596060,00.html>. ↑ Tramontana (English - tramontane) is "a classical name for a northern wind", from tra i monti, meaning "from the mountains"
Wikimedia Commons has media related to La Befana. "Christmas in Abruzzo: La Befana". Abruzzo. Archived from the original on 2013-03-13. Retrieved 24 February 2015.